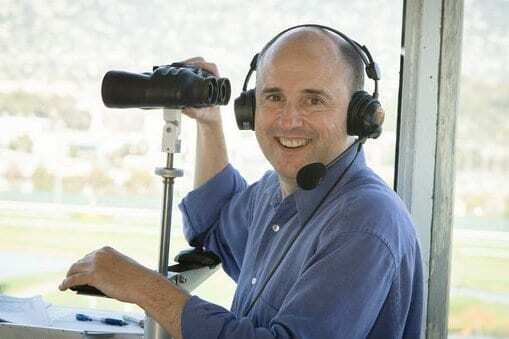 Michael Wrona, one of the world's preeminent race-callers and the voice of Santa Anita Park, has been named track announcer for Kentucky Downs' live race meet. Kentucky Downs' 2019 meet is Aug. 31 and Sept. 5, 7, 8 and 12 over North America's only European-style turf course. The showcase race meet, which offers the world's largest purses outside Japan, falls when Southern California thoroughbred racing is at Del Mar and Los Alamitos, making Wrona available. John Lies has served as Kentucky Downs track announcer in recent years. The 52-year-old Australian-born Wrona has earned a reputation as one of the sport's most colorful and entertaining announcers, weaving humor into precise calls. He was named Santa Anita's permanent announcer in 2016 following that track's international search to replace the iconic Trevor Denman, who wanted a reduced work schedule while retaining his Del Mar post. Wrona's simple proclamation of “Racing!” as the horses spring from the gate is among the best-known race-call signatures in the sport. Wrona said he was surprised but delighted to be offered the Kentucky Downs position. Wrona started calling races in 1983 at age 17 at Kilcoy Racecourse, near his hometown of Brisbane, Australia, and continued to call thoroughbred, harness and greyhound races around Brisbane until coming to America in 1990, serving as Hollywood Park's announcer for the balance of the Los Angeles track's season. Besides Santa Anita and Hollywood Park, Wrona's extensive resume includes serving as announcer at Bay Meadows and Golden Gate Fields in Northern California, Chicago's Arlington Park, Retama and Lone Star Park in Texas, New Orleans' Fair Grounds, Turf Paradise in Phoenix, Los Alamitos thoroughbreds and California's Sonoma and Fresno fair meets. He actually had a previous tour of duty in Kentucky, calling the races at Bluegrass Downs in 1993-94 when the former quarter-horse track in Paducah fleetingly conducted thoroughbred racing before turning to harness racing. Wrona's first time to see Kentucky Downs in person coincidentally was this past meet, when he and his wife, Kathy, attended Old Friends Day while on vacation. Wrona said the closest he'd come before to seeing Kentucky Downs was driving by on Interstate 65 back in 1993 when the track was called Dueling Grounds and he was working at Bluegrass Downs. Wrona's natural reflex as an announcer was to watch the races while processing what it would take to call them. “It's with some trepidation that I'll step up to the mic for Race 1 on Day 1, because it is a rather low elevation from which the announcer works,” he said with one of his frequent laughs. “You also have what I would call a false stretch, where they're basically coming head-on at you for the first half of the stretch before they bend again. So it's potentially something that could take a while to get used to, but how can you take a while to get used to something when you've only got five days per year? Follow Michael Wrona on Twitter @Michael_Wrona. Here is Michael Wrona's call of the 1996 Citation Challenge at Arlington Park, with Cigar scoring his 16th consecutive victory. This entry was posted in NL List, People and tagged john lies, kentucky downs, michael wrona, santa anita, ted nicholson, track announcers, trevor denman by Edited Press Release. Bookmark the permalink.